Senior Belinda Niu follows through on a hit during Sunday’s Big Ten Championship match. Niu’s comeback from down 5-2 in the third set gave Northwestern its 15th conference tournament title in 16 years. Four hours of literal and figurative back-and-forth play had passed, and Northwestern’s Big Ten Tournament run appeared over. The No. 17 Michigan Wolverines (21-4) led the Cats 3-2, and though NU’s Nida Hamilton was on the verge of victory, Belinda Niu was down. Niu, a senior and four-time All-Big Ten selection, had won her first set but dropped the second and now trailed in the third 5-2. But as Hamilton closed out her match to pull the two teams even, Niu stormed back, winning five straight games to give No. 11 NU (19-6) a 4-3 victory and its 15th Big Ten Tournament title in 16 years. Sunday’s action was intense from the start. In front of a standing-room-only crowd, the Cats narrowly dropped the doubles point to the Wolverines, winning one match 8-2 and losing the other two 8-7 and 8-6. And that was only the prologue to a drama-heavy round of singles play. Michigan struck first, as No. 10 Emina Bektas staved off the match point to defeat senior No. 37 Veronica Corning 2-6, 7-5, 6-0. Minutes later, sophomore Alicia Barnett scored the Cats their first point, defeating No. 124 Sara Lee 6-3, 2-6, 6-3. After Michigan’s Brooke Bolender defeated Manon Peri to make the score 3-1 in favor of the Wolverines, the excitement intensified. Junior Lok Sze Leung held off No. 125 Amy Zhu in two slow, up-and-down sets, 7-5, 7-5. That left just Niu and Hamilton, both needing to win their matches to secure the title. 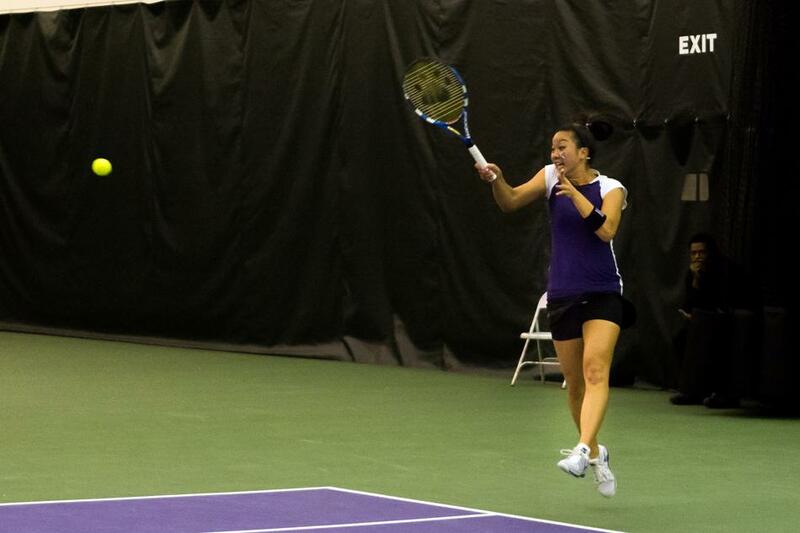 Hamilton was the only NU player to lose her first set but battled back to win the second and take a lead in the third. After Hamilton won a tiebreak for a 1-6, 6-3, 7-6 victory, all eyes fell on Niu. Even as Niu fell behind, coach Claire Pollard was confident. Niu’s remarkable victory sealed yet another title for the Cats and avenged the team’s only conference loss of the season, a 4-3 defeat April 5 in Ann Arbor, Mich., that allowed the Wolverines to seize the regular season conference title. The Cats got to the championship game by dispensing a pair of formidable teams. After enjoying a first round bye, NU breezed by No. 48 Indiana on Friday, 4-1, dropping the doubles point but winning the match. It was the first time all season the Cats had won a match without the doubles point and foreshadowed what was to come against Michigan. Then, on Saturday NU beat No. 36 Ohio State in a match not quite as lopsided as the 4-0 final score indicates. The Cats faced some danger in three of the six singles matches but won the other three before the Buckeyes could notch a point. That set up Sunday’s remarkable championship game and another conference title. Pollard, of course, said the winning doesn’t get old.